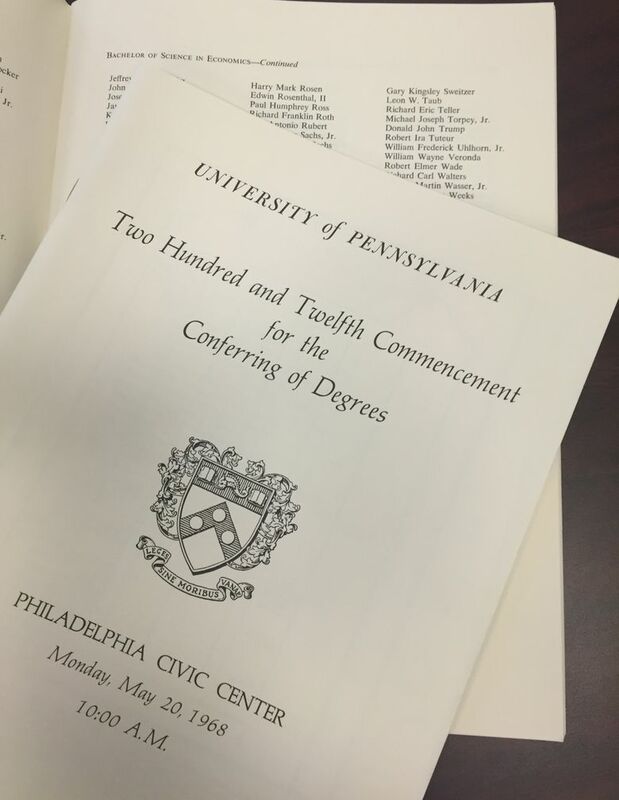 PHILADELPHIA (AP) — You don’t hear Ted Cruz talk much about his Princeton degree. Hillary Clinton doesn’t often mention Yale. But Donald Trump can’t stop trumpeting his Ivy League pedigree. But Trump’s relationship with his alma mater is complicated. Trump loves to put his name on hotels and skyscrapers, but no buildings bear his name at the University of Pennsylvania, where Wharton is located. School officials don’t like to talk about him, though he’s one of their most famous alumni. A pro-Trump student group has shut itself down, and student Republicans say he’s an embarrassment. Even the Penn bookstore, where tables are piled high with works by alumni, had just one copy of Trump’s best-seller from the 1980s, “The Art of the Deal,” on a shelf in the back. And if you assumed his degree was an MBA, you’d be wrong. Trump holds a bachelor of science degree in economics from Wharton, earned after transferring in as a junior from Fordham University. Several early Trump profiles, including a 1973 New York Times piece, stated that he graduated first in his class at Wharton, but that has since been disputed. 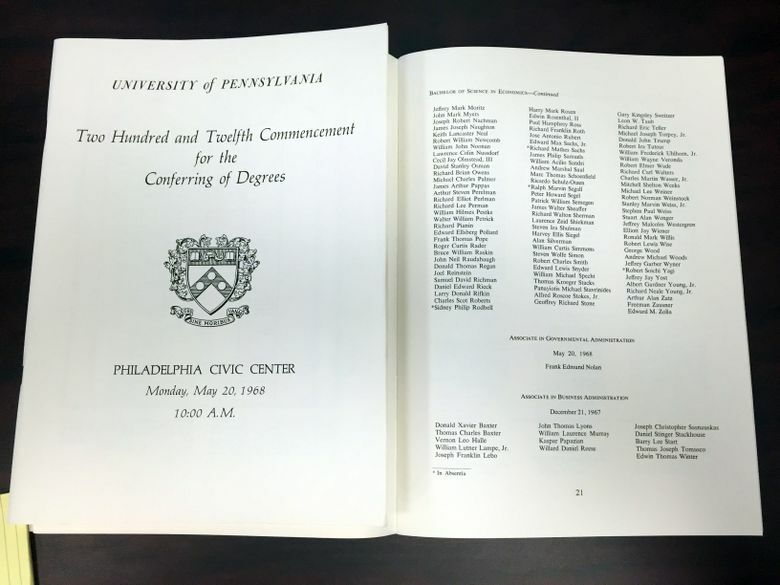 A 1968 commencement program does not list his name among students who graduated with honors. Why mention Wharton at all? Polls show that Trump’s biggest supporters are working-class whites — a demographic that might disdain an Ivy League diploma as elitist. Thomas O’Guinn, a marketing professor at the University of Wisconsin, says that paradox is part of Trump’s brand. Wharton listed Trump among its 125 most influential people in a 2007 alumni magazine issue. But it’s not clear how much money Trump has given his alma mater. The school would not comment, saying donations are confidential, but a “draft honor roll” of recent alumni donors that appeared online in March did not have Trump’s name on it. 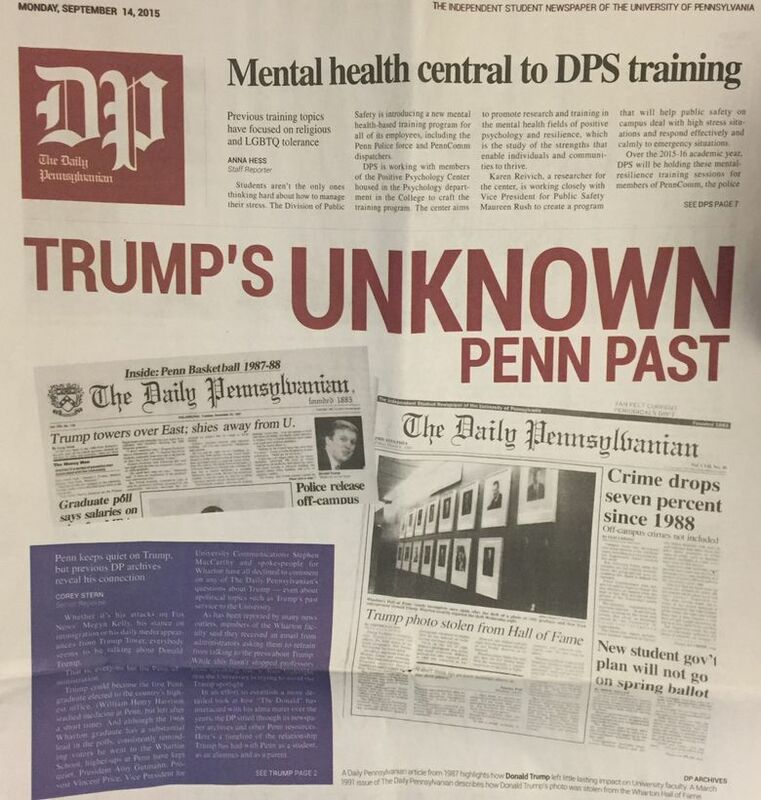 The student paper, The Daily Pennsylvanian, reported that a real estate center was established at Wharton in 1983 with Trump as one of 100 founding members, and that Trump once gave Penn over $10,000, but the exact amount was not disclosed. In contrast, Penn’s West Philadelphia campus reflects the generosity of other wealthy alumni. There’s Wynn Commons, named for Las Vegas impresario Steve Wynn; the Perelman Quadrangle, named for financier Ronald Perelman, and an entire Wharton building named for billionaire Jon Huntsman. Trump’s name can be found in one spot on campus, but you have to hunt for it. Inside Van Pelt library, in an area called the Weigle Information Commons, there’s a seminar room. 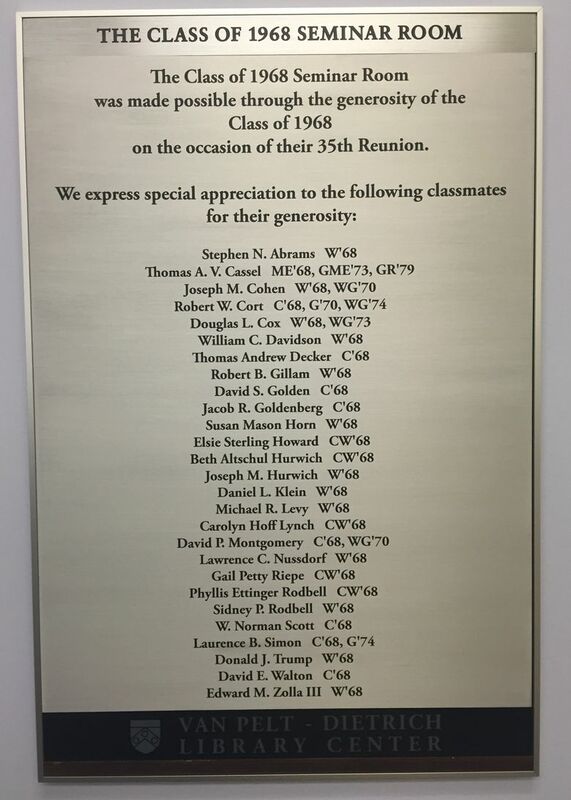 A small plaque on the wall thanks the Class of 1968 for funding the room on the occasion of their 35th reunion, and Trump’s name is one of 27 alumni listed. In the Penn ’68 yearbook, Trump’s name appears on a list of “students not photographed.” He went home to New York City most weekends, skipping study groups other students attended, according to his Wharton ’68 classmate Lou Calomaris. “He wasn’t going to have to study a lot. He was going to get a gentleman’s degree,” said Calomaris, who, like Trump, was one of a handful of students who concentrated on real estate. Wharton officials declined to make their dean, Geoffrey Garrett, or any professors available to talk about Trump. 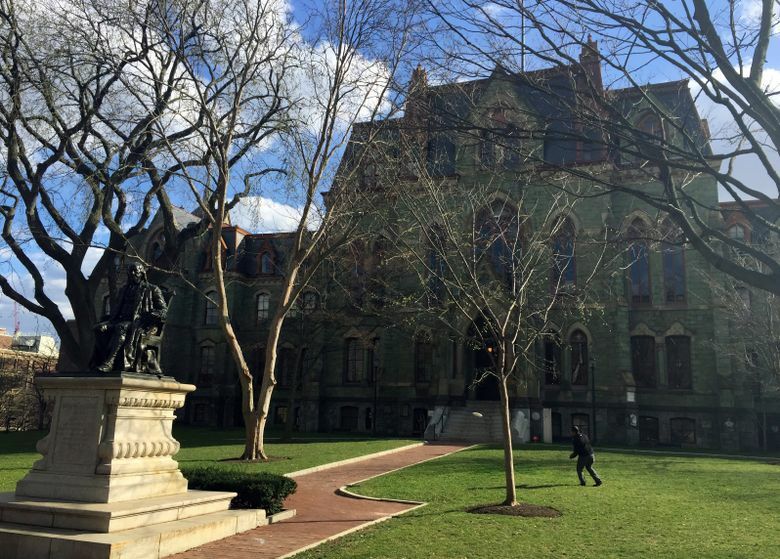 “We have no info,” said Wharton media relations director Peter Winicov in one email. Trump’s campaign did not make him available for an interview for this story.